I have one month until our new baby arrives. I've been trying to prepare my boys for her as much as I can. I had a plain muslin blanket in a pack I had purchased, so I thought it would be perfect to let the boys design a blanket for her. It's meaningful for them and for me....and even for the baby once she's a little older. It's an easy, fun project that any child would love to try out. 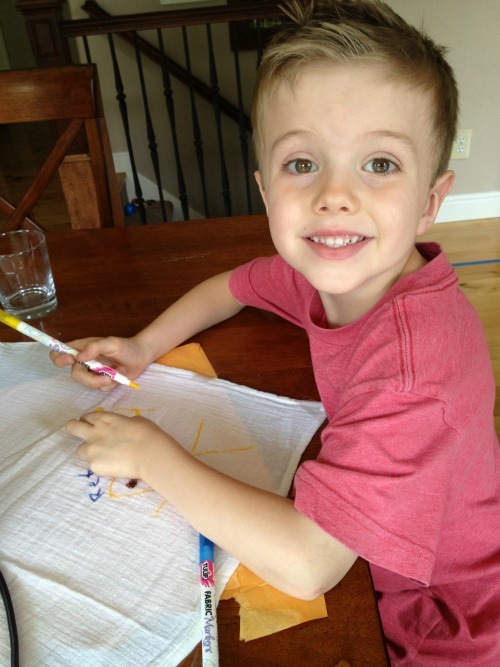 I got out my Tulip fabric markers for my 5-year-old son to use. I put paper underneath the blanket to make sure it wouldn't leak through. (It's a really thin blanket.) Then I taped the blanket down the best that I could. This particular fabric stretches and shifts a lot, so it's a little harder to draw on. 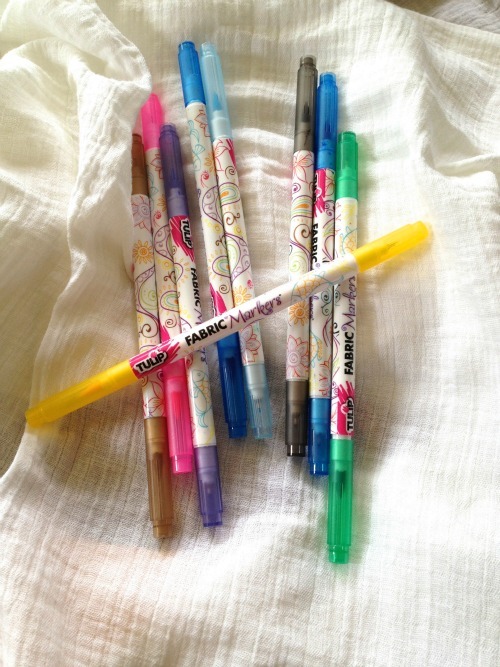 He did fine with the markers, though. 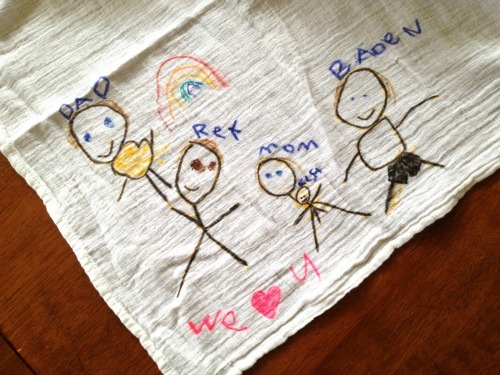 He drew our family and then I helped him darken it in a little more once he was all done. 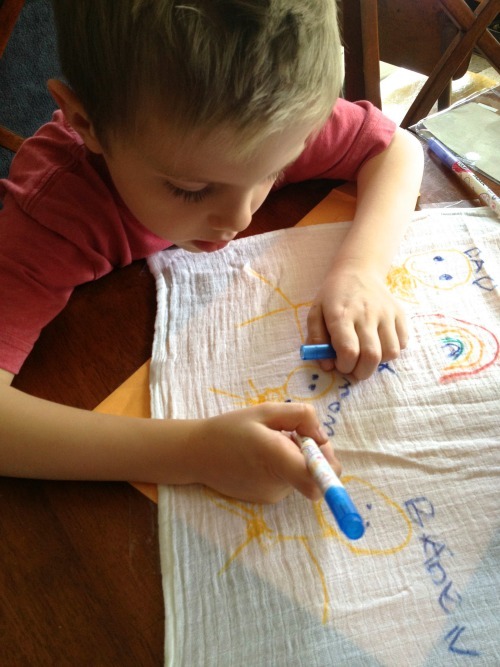 His art always makes me happy and it's nice that fabric markers are even easy enough for a 5-year-old to use. He was pretty proud of his finished work. I think it'll be our favorite blanket to wrap her in. 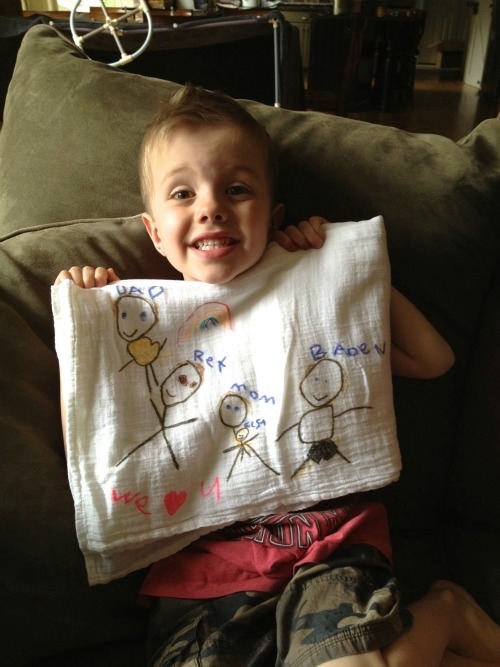 Such a cute idea... and those thin blankets are AMAZING! We got the 4-pack as well. My daughter (1year old) LOVES them. they are the item she is most attached to. What a wonderful idea! I'm going to pin this to use when we are ready to have #3. Would even be a great gift idea for new nieces or nephews. This is such a great idea! 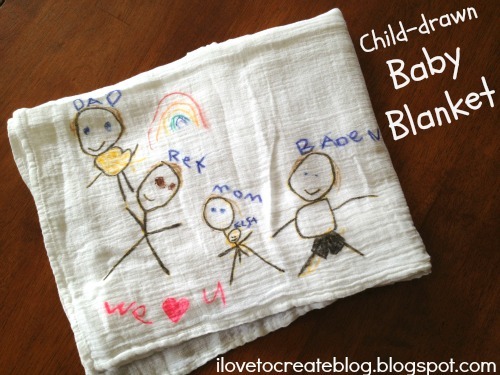 I love muslin blankets and this makes a cute keepsake out of the plain ones. My youngest just turned 2 and I still want to do this!